Saint Francis Foundation and the Saint Francis Medical Center Auxiliary awarded healthcare scholarships to 24 area students on August 3. 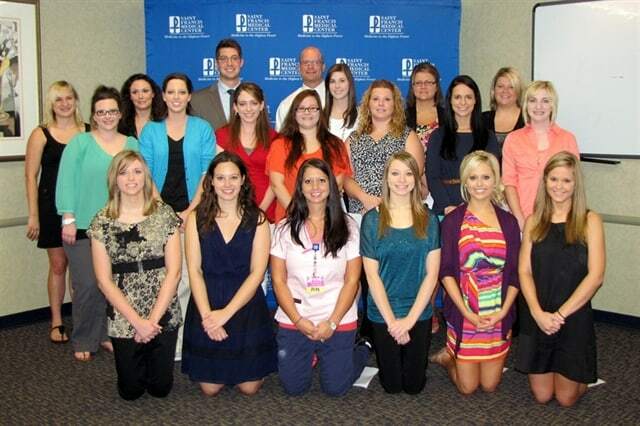 Each student received $2,000 in education scholarships toward a degree in a healthcare-related profession. The Saint Francis Foundation and Auxiliary Healthcare Scholarship Program was created in 1980. Since its inception, the program has provided more than $393,000 in education scholarships to college students pursuing professional healthcare careers. Recipients must have completed at least one year of an accredited healthcare program, maintaining a minimum 3.0 GPA. Allison Bueter, Leopold, Mo. – Saint Francis Auxiliary Healthcare Scholarship. Beuter is a student at Maryville University in St. Louis, where she expects to graduate with her master’s degree in occupational therapy in 2014. After graduation, she hopes to work with Autism patients. Janice Bueter, Leopold, Mo. – Lee G. and Katherine Cochran Memorial Scholarship. Beuter is a student at the University of Missouri-Kansas City School of Pharmacy, where she plans to graduate in 2015 with a doctorate in pharmacy. After graduation, she would like to work in a hospital and specialize in oncology pharmacy. Kelsey Christian, Dexter, Mo. – Clara D. Newnam Memorial Scholarship. Christian is a student at Southeast Missouri State University, where she expects to graduate in December with her Bachelor of Science in nursing. She currently works at Saint Francis in the Sterile Processing department. Stasha Cook, Chaffee, Mo. – Bernadean Campbell Memorial Scholarship. Cook is a nursing student at Three Rivers Community College in Poplar Bluff, Mo., where she expects to graduate in May with her associate degree in nursing. She works as an licensed practical nurse at Saint Francis and is married with three children. Danece Curtis, Tamms, Ill. – Mamie Hall Memorial Scholarship. Curtis is a registered nurse at Saint Francis’ Family BirthPlace. She is a student at Chamberlain College of Nursing and plans to graduate with a Master of Science in nursing in 2014. She and her husband have three children. Alecia Glaus, Chaffee, Mo. – Saint Francis Auxiliary 125th Anniversary Scholarship. Glaus is a nursing student at SoutheastHEALTH College of Nursing and Health Sciences, where she expects to graduate in May. She is currently president of the National Student Nurses’ Association and previously served as vice president. Hannah Glueck, Chaffee, Mo. – Evalyn and S. David Nunley Scholarship. Glueck is a student at the University of Missouri-Columbia and expects to graduate with her doctorate in physical therapy in 2013. Jennifer Hinkebein, Jackson, Mo. – Lucy Ellen Towse Memorial Scholarship. Hinkebein graduated from the University of Missouri-Columbia with a bachelor’s degree in nutrition and fitness. She is currently a student at Missouri State University in Springfield, where she expects to graduate in May of 2013 with a doctorate in physical therapy. Jenny Holmes, Chaffee, Mo. – Sisters of Saint Francis Scholarship. Holmes is a student at Three Rivers Community College in Poplar Bluff, Mo., where she plans to graduate in May 2013 with an associates degree in nursing. She is currently an licensed practical nurse at Saint Francis Medical Center. David Jenkins, Cape Girardeau, Mo. – Bess Estes Healthcare Scholarship. Jenkins is a graduate of Southeast Missouri State University with a degree in biomedical science. He is currently a student in the Medical Laboratory Science program at SoutheastHEALTH College of Nursing and Health Sciences, where he expects to graduate in May 2014. Kayla Joyner, Dexter, Mo. – Joseph and Harriette Hunter McCrate Scholarship. Joyner is a student at the University of Missouri-Kansas City and expects to graduate with a doctorate in pharmacy in 2015. Stacy Latham, Benton, Mo. – Mark F. Scully Nursing Scholarship. Latham is a student at Southeast Missouri State University where she expects to graduate in December of 2012 with a Bachelor of Science in nursing. Sarah Liefer, Chester, Ill., – Susan E. Hinkebein Memorial Scholarship. Liefer is nursing student at Southeast Missouri State University, where she plans to graduate in May with a Bachelor of Science. After graduation, Sarah would like to work in an intensive care unit to obtain experience to further her career as a nurse anesthetist. Kayla Moore, Advance, Mo. – Saint Francis Foundation Scholarship. Moore is a student at Southeast Missouri State University, where she plans to graduate in May with a Bachelor of Science in Nursing. After graduation, she would like to become a pediatric nurse. Miranda Mudge, Jackson, Mo. – Saint Francis Auxiliary Physician Honor Scholarship. Mudge is a student at Missouri State University in Springfield and expects to graduate in 2013 with her bachelor’s degree in biomedical science. This one-time scholarship was made possible through contributions from physicians at Cape Medical Oncology in honor Dr. Stanley Sides for his more than 30 years of service to Saint Francis Medical Center. Stephanie Nanney, Whitewater, Mo. – Christen Joyel Aufdenberg Memorial Scholarship. Nanney is a student at Three Rivers Community College in Poplar Bluff, Mo.. She currently works at Saint Francis and will graduate in May with her associate’s degree in nursing. Jerimy Obergoenner, Jackson, Mo. – Carrie Suedekum Memorial Scholarship. Obergoenner is a student at Southeast Missouri State University Cape Girardeau Partnership for Higher Education, where he plans to graduate in 2013 as a physical therapy assistant. He currently works in the Communications Department at Saint Francis. Lora Osmer, Kennett, Mo. – Ken Hayden Memorial Nursing Scholarship. Osmer is a student at SoutheastHEALTH College of Nursing and Health Sciences, where she plans to graduate in May. She is a nurse extern at Saint Francis Medical Center in the Level III Neonatal Intensive Care Unit. Morgan Peters, Jackson, Mo. – Edythe M. Davis Memorial Scholarship. Peters is a student at Southeast Missouri State University, where she plans to graduate in December with her Bachelor of Science in nursing. After graduation, she would like to work in an intensive care unit and further her education to eventually become a nurse anesthetist. Shannon Ratcliff, Cape Girardeau, Mo. – Huttegger-Scherer Memorial Scholarship. Ratcliff is a student at Southeast Missouri State University and plans to graduate in December with a Bachelor of Science in nursing. She currently works as a monitor tech at Landmark Hospital. Jerica Rogers-Lemons, Zalma, Mo. – Earl Jr. and Lori Wills Memorial Scholarship. Rogers-Lemons is a student at Southeast Missouri State University and plans to graduate in May with a Bachelor of Science. She currently works at Saint Francis Medical Center in Food and Nutrition Services. Erin Steffens, Jackson, Mo. – Raymond A. and Lilian K. Ritter Scholarship. Steffens is a nursing student at Southeast Missouri State University, and plans to graduate in December with a Bachelor of Science. Her career goal is to become a geriatric nurse practitioner. Mack Taylor, Dexter, Mo. – Saint Francis Auxiliary Physician Honor Scholarship. Taylor is a medical student at University of Missouri-Kansas City, where he plans to graduate in May 2014. After graduation, he plans to practice dentistry in Southeast Missouri. Nikole Tuschhoff, Cape Girardeau, Mo. – Raymond A. and Lilian K. Ritter Scholarship. Tuschhoff is a student at Southeast Missouri State University, where she plans to graduate in May with a Bachelor of Science in nursing. She is also a nurse assistant at Saint Francis in the Inpatient Rehabilitation department. For more information about the Saint Francis Foundation and Auxiliary Healthcare Scholarship Program, contact Carrie Copeland, CRT, BSN, MBA, development officer, at 573-331-5790.